Perhaps you will remember me writing you about another of Jill's books that I have been reading for some time a few weeks ago. It was called The Deep Place. I enjoy her writing and spurring on very much. 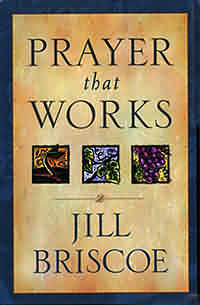 I picked this book up because I have great respect for Jill's teaching on prayer. I have been moved to tears by her prayers. The title threw me for a loop, but I knew that the teaching in it would be sound. When you read a title like Prayer That Works, it conjures up thoughts of tv preachers assuring you that you can have your best life now. I found nothing of the like in these pages. I generally arise to meet with the Lord at 6 a.m. I am jealous for my time to sit in listen to His word. This book has been the last leg of my morning quiet time for the past two weeks. I did not read it like I would a normal book because I was caught up in the teaching. I did the Prayer and study at the end of each chapter. It truly helped me to see some things in a way that I had not before and was a challenge to my prayer life. I was moved reading the accounts of Elijah and Elisha. For the first time I really connected to their story in a personal way where I felt like I knew and understood these men. God has used their testimony to overcome many a wall of prayer in my life and deliver me to a desperate place of total dependance. Jill's words stay on task with the truth of the Holy Spirit. You can feel Him teaching and guiding you as you read the words first and second Kings. God is a big God and we barely touch the hem of knowing Him. Let us dig deeper. Every now and then you hear something that deeply resonates with you. You can't forget it, it always stays with you in your head. This happened to me when you said our God is a big God and we barely touch the hem of knowimg Him. I needed to hear this as I press on to seek more of Him and know more of His word, you start to feel all alone in doing this. is this a christian website? if so i have one too! i love christ with all my heart and i hope this site will help others feel the same way about christ as i do! please visit my site too! thank you!